When Douglas Young walked into the career counseling office at Wounded Warrior Project® (WWP) headquarters in Jacksonville, Florida, he had already accomplished much. 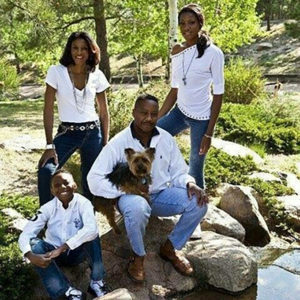 He is a decorated veteran with 24 years of service in the United States Air Force. He already had professional achievements, educational accolades, and a beautiful family. 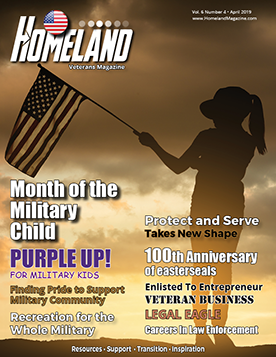 In 2015, as he retired and relocated, he realized he wanted guidance turning his military career into a valuable civilian job opportunity, and specifically, writing a resume that reflected a lifetime of military achievement and relevance to today’s workforce. Douglas grew up in Belton, South Carolina. He spent summers with his four uncles – all veterans from the Vietnam War. They had served in the Air Force, Navy, and Army – and Douglas immediately saw common values of honor, service, and valor among them. Douglas secured a Navy ROTC scholarship to the University of South Carolina, and after college, he chose the Air Force with plans to enlist for four years and possibly return to a banking career. But he was having too much fun with his military role, which turned into an impressive 24-year military career. During his Air Force career, Douglas held several high-level positions that placed him in charge of multi-million-dollar projects and managing hundreds, if not thousands, of military personnel. Serving as Director, Support Directorate at the U.S. Embassy in Kuwait was one of Douglas’ favorite roles during his military career. During this time, his military training (Defense Intelligence Agency and Air Force Special Operations) and university education (international relations and economics) intersected into an opportunity of a lifetime. 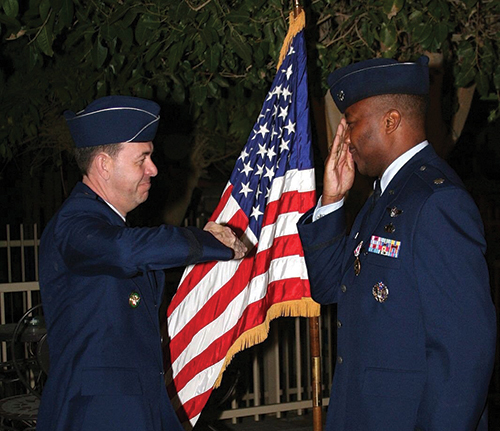 Douglas eventually moved on from his position in Kuwait and relocated to Denver where he served as Director, Air Force Reserve Promotion Board Secretariat. On a normal Colorado evening with the family sitting at the dinner table, Douglas floated the idea of retiring from the military. Family had always been a driving force in his life, and he valued the opinions of his wife and two children. “It was a good time. At some point in your life, your family’s needs begin to tip the balance of what is important. When that happens, it is time to hang up the uniform and follow a new path,” Douglas said. After a move to Florida, Douglas applied for several open positions. He found more doors closing than opening, and felt that his location change had disconnected him from the relationships needed to secure the type of job he had imagined. But Douglas was not deterred. He recalled how his military training had equipped him with a mindset that is crucial to helping transition from one role to another, one location to another, or in this case, one career to another. Douglas persevered and, with help from WWP, landed a civilian job. Douglas found WWP and its Warriors to Work® program – a career counseling service – through his VA representative. He registered and immediately attended a resume writing workshop and networking event in Jacksonville. “This was a service I needed help with. My resume had been military for the past 24 years and highly technical, so having people at Wounded Warrior Project take my military resume and go through it line by line, translating my experiences into a resume that was civilian-job-friendly was a huge help,” Douglas said. WWP offers career counseling services to empower wounded veterans to achieve their highest professional ambitions. This includes resume writing workshops, interviewing tips and techniques, and networking events with local companies looking to fill positions or offer specialized training in long-term career tracks. “The services, care, and guidance of Wounded Warrior Project gave me confidence in my ability to go out, knock on doors, and apply for jobs that I was interested in doing. This gave me the confidence to find something I was passionate about and worthy of spending time on during my retirement years,” Douglas said. “This was a level of support that I didn’t anticipate, but absolutely appreciated,” he added. 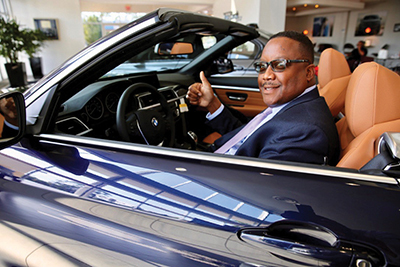 Douglas has been a passionate admirer of BMW cars since 1986. While preparing his new resume and thinking about next steps, Douglas’ wife suggested he should do something he loves and consider working at BMW. That November day, General Manager Danny Assi and several members of the management staff interviewed Douglas. Within seven days, he was offered the role of client advisor. Reflecting on his professional life, Douglas admitted he had never sold anything but ideas, so selling BMWs was something he had never even considered. However, of the many differences in his professional paths, there has been one constant philosophy – do your best to move forward and connect with and serve people. “The first BMW I sold, which was my third day on the job and still in training, was to a Navy SEAL. I went on to become the 2016 salesman of the year along with many other performance recognitions,” Douglas said. “When you find your new mission in life, seek assistance from organizations like Wounded Warrior Project. They are excellent at what they do and can assist in ways you didn’t think of. They are able to highlight your strengths, help you realize potential, and in many cases can introduce you to potential employers or help you make the right connections toward your goals,” Douglas said. Douglas continues to check in regularly with WWP’s career counseling staff and is looking forward to meeting and interacting with other wounded veterans during future WWP programs. He hopes that, one day, he too can lend a helping hand to a fellow wounded veteran in the same meaningful way he was helped. 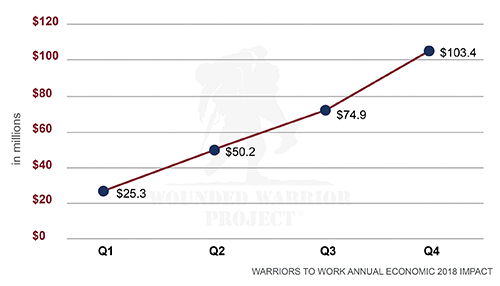 For the first time in Warriors to Work® history, the Wounded Warrior Project® (WWP) career counseling program has surpassed $100 million in economic impact in a single year, which represents the combined total salaries of newly employed veterans served by WWP. Warriors to Work builds on warriors’ enthusiastic desire to succeed, the hard work and commitment of WWP staff, and an emphasis on partnering with local and national companies seeking quality employees. Tom Kastner serves Wounded Warrior Project® (WWP) as financial wellness vice president. He provides leadership to Warriors to Work, Veterans Benefits, the Resource Center, Warrior Registration, and the Emergency Financial Assistance program. Before joining WWP, Tom worked at the senior manager level for Mercedes Benz, USA and Amazon, LLC. In addition, he served as a senior administrator and academic dean at two private military boarding schools. A graduate of the United States Military Academy, Tom retired from active duty after a 30-year career as an infantry officer and operations research analyst.